Sun City Arizona is packed with exciting activities for retired adults, access to all sorts of shopping, medical care, fine dining, grocery shopping, and more right within the boundaries of the area. The concept was simple, a place to live where there is plenty to do, shopping is close, there are no schools, taxes are low, and no one has to fight with the snow. Sun City offers retirees a place to go to escape shoveling snow and trying to keep up with yard work. Sun City, AZ was the first retirement community purpose built from its inception, and many say the best. 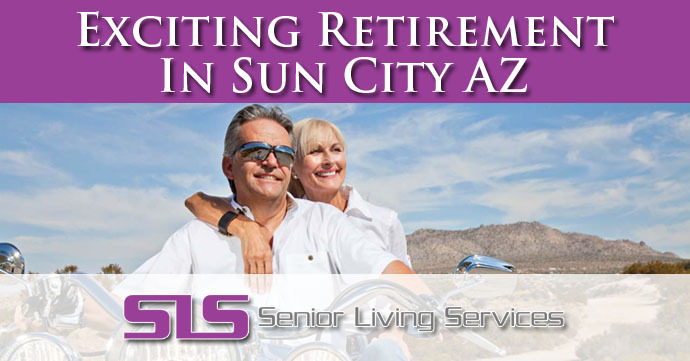 The vast majority of features no standard in 55+ retirement communities across the country started in Sun City. That includes the concept of building an entire community which is dedicated to the recreation and leisure for active retired adults. Having been established for more than 50 years Sun City has prospered and matured to be one of the best value retirement areas in the country. Ultimately the legacy is to continue to provide residents with the finest place to retire in the state of Arizona, the country, and the world. Boswell Hospital was the first hospital in the area, and named after the man that originally owned the area of Sun City. The hospital has been complimented by a number of facilities and services which meets the areas needs. In fact even Banner Boswell Hospital received a multi-million dollar expansion in 2008 and has achieved a rank in the top 100 hospitals in the country. That makes the heathcare amenities that are available in Sun City simply some of the very best in the nation. Sun City enjoys having many golf courses close by, seven recreation centers, two bowling centers, a 33-acres man-made lake, and many restaurants. Sun City is absolutely packed with opportunities for activity and entertainment. There are crafts, concerts, sports, swimming and much more. With over 120 chartered clubs there are near limitless ways to keep busy, active, and live a very life rich with experiences, friendship, and fun. The types of clubs are enormously varied and include things like jewelry making, wood working, calligraphy, knitting, stained glass, metal working, leathercraft, painting, quilting, and ukulele playing just as a sample. Many residents rightfully claim that the only people that are bored in Sun City are those that choose to be. There are plenty of other things to do in Sun City including: fishing, soft ball, basketball, billiards, lawn bowling, photography, racquetball, shuffleboard, aerobics, model railroad clubs, and a wealth of different card clubs. With many big names, exciting concerts, and the Sun Bowl outdoor concert venue that seats as many as 7,000 people there is plenty of opportunity to enjoy music in Sun City. There are weekly free events on Sunday nights and more than enough to take in. The area was originally opened on January 1st 1960 with only 5 model homes, 1 shopping center, a recreation center and 1 golf course. Time magazine featured the story on their cover when over 100,000 people attended the opening weekend, which was more than 10 times higher than they had dreamed. It was an original concept to have an area where age restriction was required to sign a deed to live in the area. At least one resident must be 55+ or older and no one under the age of19 may live in the area. What the result is for retirement age adults is something that might be what Disney would make for retirement. There are many great retirement communities in and near Sun City that offer a wide variety of active retirement living services. These retirement communities have services such as independent living, assisted living, and memory care. This means that the area provides near limitless opportunity for entertainment, activities and shopping while quality retirement communities take care of the details and health for many of the residents. Why Retire In Sedona Arizona?